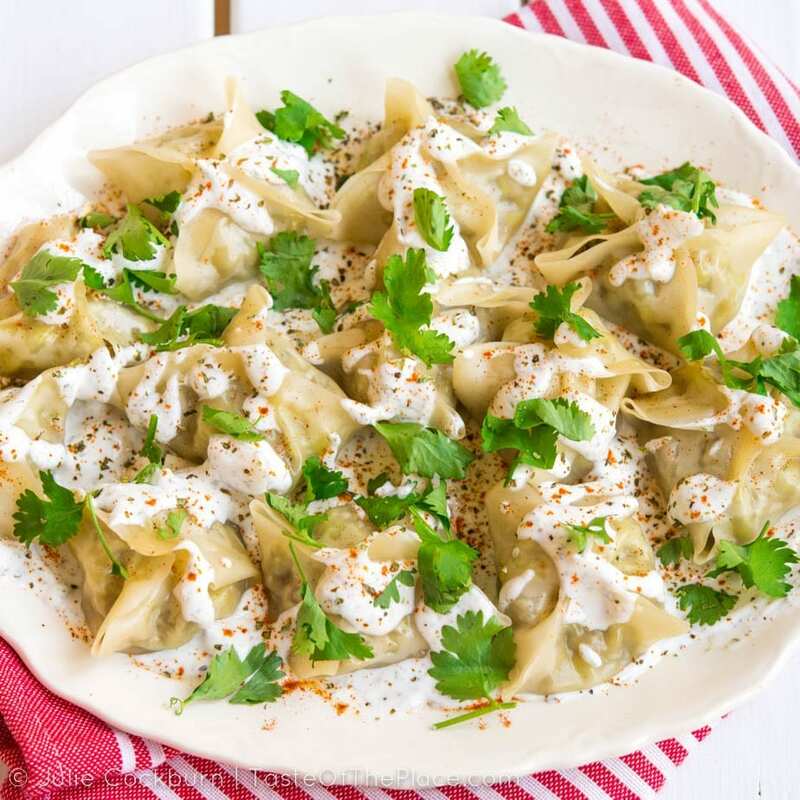 Seasoned beef and onions, tucked away in a tender wrapper, and topped with an herby yogurt sauce make this delicious recipe for Afghan mantu, or dumplings, a perfect crowd pleaser for your next party! Don’t you just love a good dumpling? Comfort food at its best! Tender, doughy outsides surrounding a flavorful filling. Yumm! Nearly every culture has its own version (or versions) of a dumpling. Some are sweet, like the Austrian and German apricot dumplings, or the Arabic Qatayef, a type of stuffed pancake, often filled with a sweet cheese or cream. 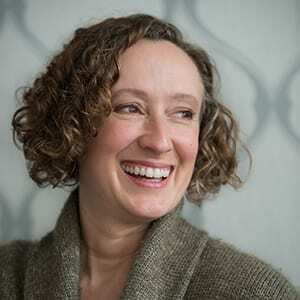 While some are savory, like the Polish pierogi, or the Argentine empanada. They come steamed, boiled, fried, baked, and even frozen. And they are loved by pretty much everyone around the globe! This particular dumpling, called mantu, comes to us from Afghanistan. Afghanistan, located at the heart of the ancient Silk Road trading routes, has been influenced by the food cultures of the Far East, India, Persia, and the Mediterranean. 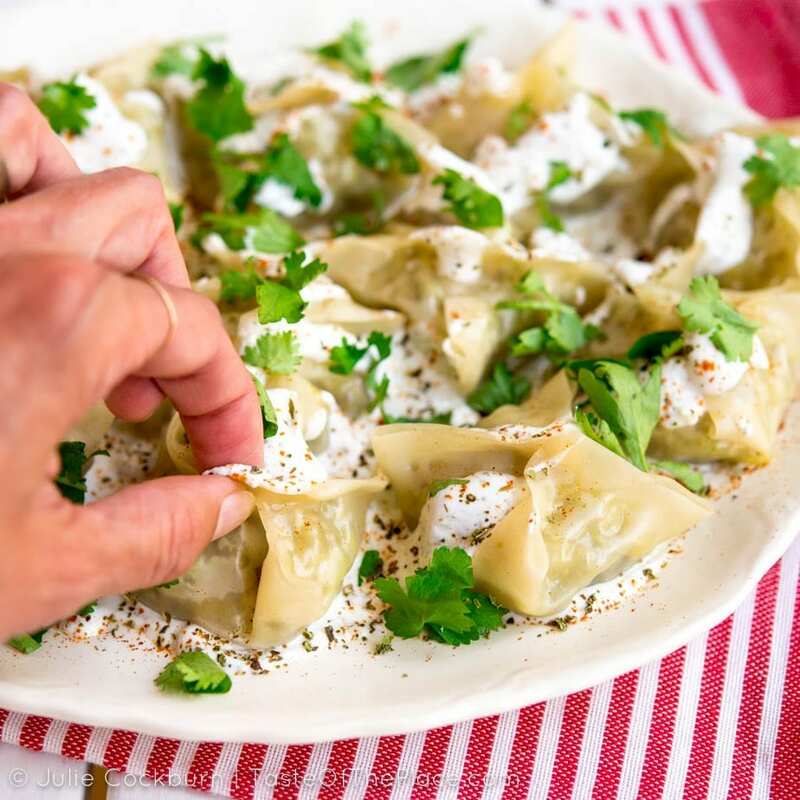 Mantu, with their wonton wrappers, spiced meat filling, and seasoned yogurt sauce, deliciously demonstrate how different food cultures can beautifully combine into heavenly dishes. Records of mantu date back at least to the Turkic and Mongol horsemen of Central Asia, who are said to have carried frozen mantu with them during cold winter journeys and boiled them in pots over campfires for a tasty and warming meal. Today, mantu are extremely popular throughout Afghanistan. The savory little dumplings are often served for celebrations, but can also be found at many markets and street vendors. While my version of mantu is on the simple side, putting the dumplings together can be rather time consuming. Stuffing and folding the wrappers is best done while sitting at the table with a good friend or two, and maybe a glass of wine or three. When wrapping the mantu, use your finger or a brush to slightly moisten the edges of the wrapper, then pinch two opposite corners together. Pinch the final two corners together to form a cute little packet, then steam in a single layer. Deliciousness just waiting to happen! If you are making the mantu for a party, you can prepare the meat filling and the yogurt sauce a day or two ahead of time. I’ve also had success holding the steamed mantu in a warm oven – just be sure to keep them covered with a piece of lightly oiled foil so they don’t dry out. 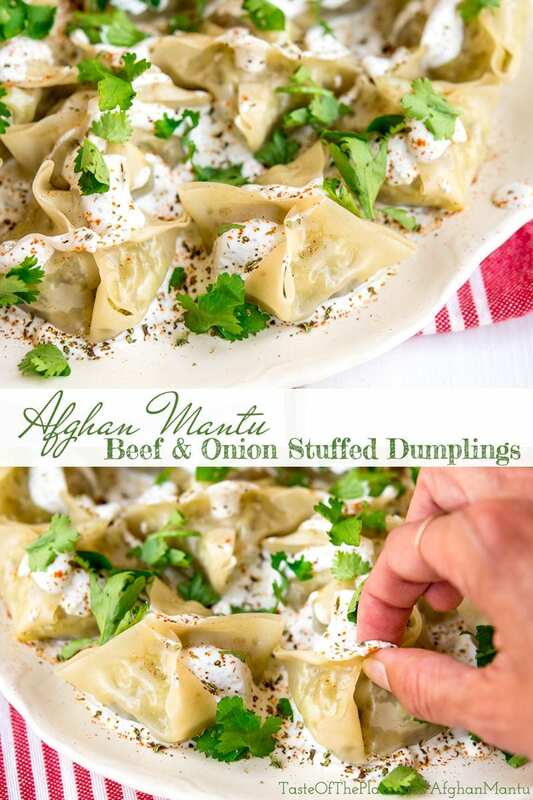 Onions are a significant ingredient in my recipe for mantu – it has almost equal parts beef and onion. I’m sure you’ll notice the onion is added raw to the filling mixture, giving the dish a strong onion flavor. If you would like to curb the raw onion-y-ness a bit, feel free to cook the onions along with the beef. I used white onions, but red or yellow would work just as well. In a small mixing bowl, whisk together the yogurt, dried mint, garlic, and salt to taste. Depending on the thickness of your yogurt, whisk in enough water, 1 tablespoon at a time, to achieve a creamy, yet drizzle-able consistency. I typically use Greek yogurt, and find that 1 cup of yogurt needs about 5 tablespoons of water. Set aside, covered in the refrigerator, until ready to use. Heat the oil in a large skillet or Dutch oven over medium high heat, until the oil begins to shimmer and move around the skillet. 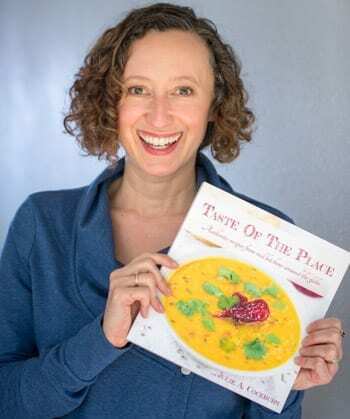 Add the beef, 1 teaspoon salt, turmeric, ground coriander, garlic, and pepper to the skillet, and cook, stirring frequently and breaking up any big chunks of ground beef, until the beef is cooked through and most of the moisture has evaporated. Remove from the heat, and stir in the minced onion and cilantro. Allow the mixture to cool slightly before moving on to the next step. 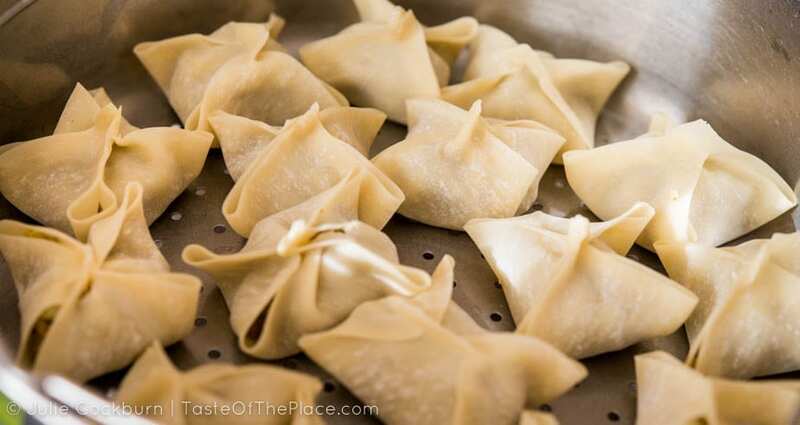 Place a small spoonful of the stuffing into the center of a wonton wrapper. With your fingertip or a pastry brush, brush a small amount of water on the outside edges of the wrapper to make it slightly sticky. 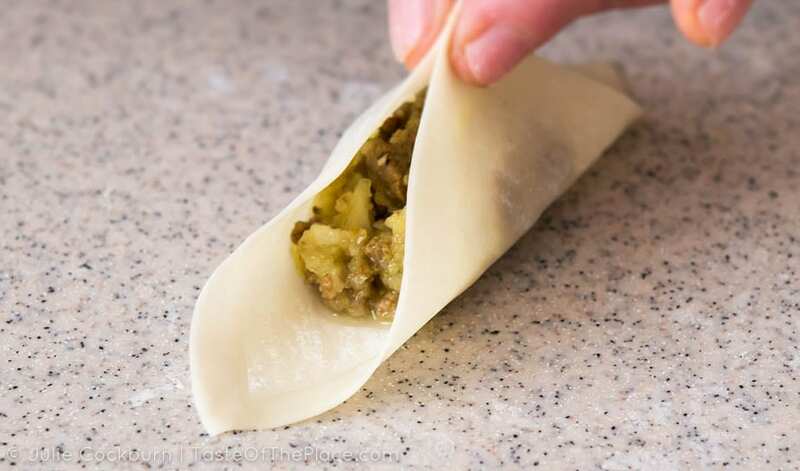 Shape the wrapper into a dumpling by first gently pinching two opposite corners together, then gently pinching the remaining two corners together. Repeat with the remaining wrappers, covering them loosely with a towel or plastic wrap until ready to steam. Don't worry if you end up with more filling than wrappers. Reserve the extra filling and scatter it over the finished dish as a garnish. Heat your oven to its lowest possible temperature, around 175°F. You will likely need to cook the mantu in batches, and you'll want to keep them warm in the oven until ready to serve. Meanwhile, heat an inch or two of water in a pot fitted with a steamer insert. Be sure the water doesn't touch the bottom of the insert. Adjust the temperature so the water stays at a steady, steamy simmer - gently bubbling and steaming, without boiling furiously. Brush the surface of the steamer insert with a small amount of oil, and gently place the mantu in a single layer, working in batches if necessary. Cover and steam until the wrappers are tender and slightly translucent, about 8 minutes. Repeat with the remaining mantu. Gently wrap the steamed mantu in a piece of foil that has been lightly brushed with oil, and place in the warm oven until ready to serve. Spread half the yogurt mixture over the surface of a large serving platter. Gently pile the steamed mantu on the platter, and decoratively drizzle about ¼ of the yogurt mixture on top. Place the remaining yogurt in a dish for dipping at the table. 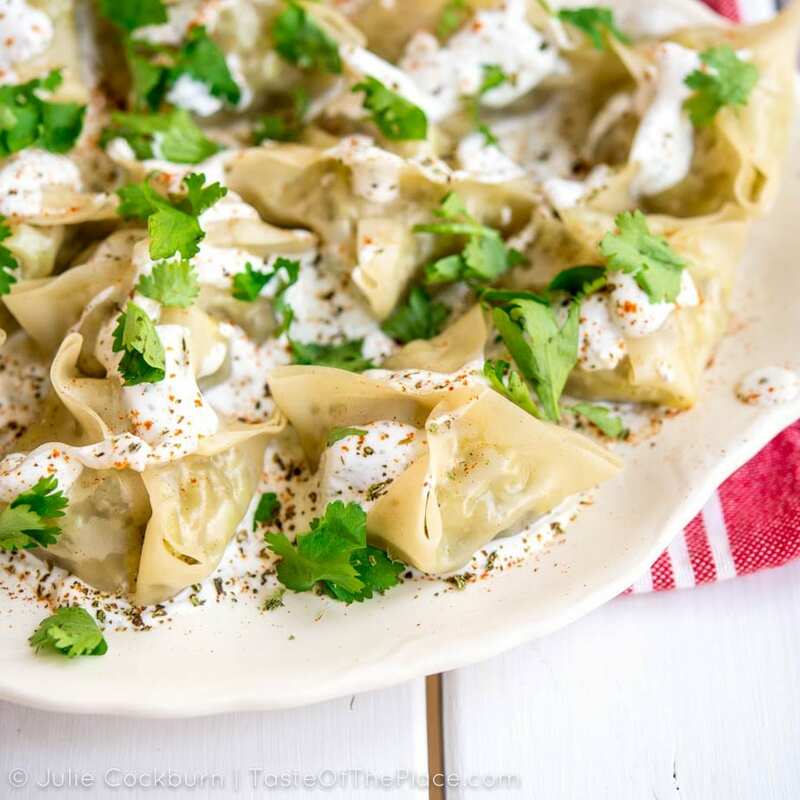 Garnish the platter of mantu with a dusting of cayenne pepper and cilantro leaves. If you would like to curb the raw onion-y-ness of this recipe a bit, feel free to cook the onions along with the beef. I used white onions, but red or yellow would work just as well. If you are making the mantu for a party, you can prepare the meat filling and the yogurt sauce a day or two ahead of time. I've also had success holding the steamed mantu in a warm oven - just be sure to keep them covered with a piece of lightly oiled foil so they don't dry out. Looking for more dumplings from around the world? Take a peek at my Pinterest board featuring some of the tastiest recipes around! These dumplings are so good. I think I especially like the yogurt sauce. They are also very cute! I enjoyed the National Geographic video about Afghanistan. They are cute, aren’t they!? Glad you enjoyed them!